CarGurus has 33,380 nationwide CX-5 listings starting at $6,990. The 2017 Mazda CX-5 doesn’t seek to conquer the entire compact crossover market—it simply wants to carve out its own niche as the sporty, upscale option. The compact SUV segment can be overwhelming. With approximately 18 vehicles technically in this category, the various options can have hugely different personalities. 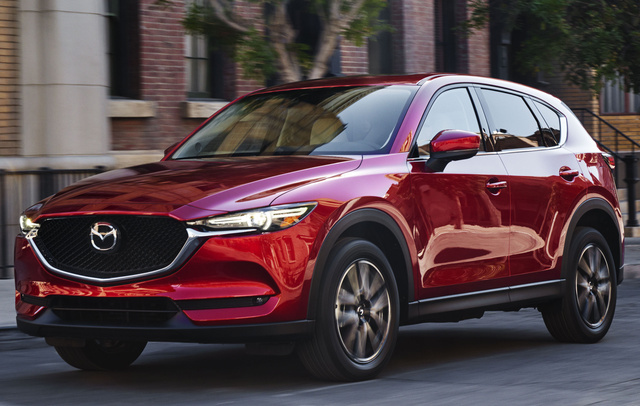 Consider how the sedan market can range from sluggish to sporty—the same range exists between the 2017 Mazda CX-5 and its rivals. In terms of actual sales, the top performers are the Toyota RAV4, Honda CR-V, and Nissan Rogue. All of these options are inoffensive, and the Rogue even has an available third row, but they aren’t very exciting, and there’s nothing wrong with that. You should just consider how you plan to use your vehicle before diving into the choices. The CX-5 falls into a second tier, along with the Ford Escape and Jeep Cherokee. The common thread among the second tier? They all offer something for enthusiasts. 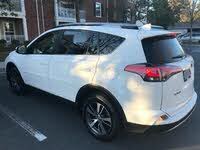 The Cherokee can actually perform off road, the Ford Escape has some solid driving characteristics, and the CX-5 is not only fun to drive, but uniquely upscale in this segment. 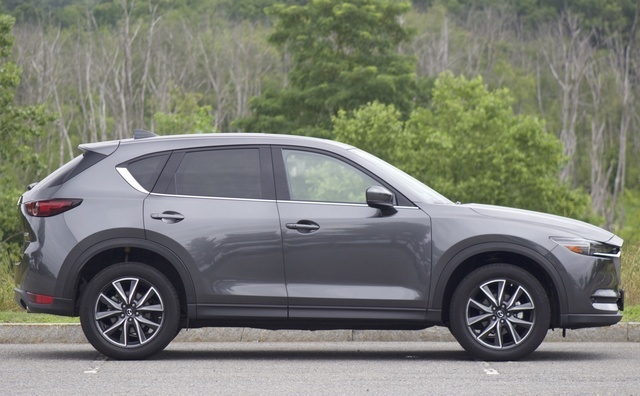 It is in this context that you must consider the Mazda CX-5: A driver might simply need a commuter car with more space, but wants something that's actually fun to drive. The typical CX-5 buyer might also want something nicer than the average crossover, but doesn’t need to make the jump to an actual luxury brand. The 2017 CX-5 is an absolute looker. While Honda is making the new CR-V look unnecessarily complicated (like someone turned Optimus Prime’s head into a commuter car), the CX-5’s exterior styling has become simpler. The large grille and thinner headlights are the latest expression of Mazda’s Kodo design language, which the CX-5 wears well. The hood is actually longer than before, despite having roughly the same footprint. That makes for a more dramatic exterior appearance, but as you’ll learn, it hurts the CX-5’s everyday usability. Inside, the new CX-5 features a clean, simple, almost futuristic cabin design highlighted by the MazdaConnect screen. This is a 7-inch screen that protrudes out of the dash and is operated via a dial in the center console. While most automakers use a full touchscreen (MazdaConnect has touch capability when in Park), this joystick-operated system is more akin to BMW's iDrive or Mercedes-Benz's COMAND. That’s not a coincidence, as Mazda is offering the CX-5 as an upmarket option in this crowded group of compact crossovers. By comparison, some other offerings might simply be considered appliances with cargo space. If you were cross-shopping near-luxury cars against the CX-5, the presence of a system like this might signal to you that Mazda is targeting a more discerning shopper like yourself. The CX-5 is available in Sport, Touring, and Grand Touring trims. The entry-level Sport trim comes standard with 17-inch alloy wheels, LED headlights, power side mirrors, and a reversing camera. It also comes with keyless entry, push-button start, dual USB ports, MazdaConnect infotainment, and Bluetooth hands-free calling. Move up to the Touring, and the cloth seats are swapped out for leatherette seating (faux, not-quite-leather material), auto-leveling headlights, heated front seats, dual-zone climate control, and a pair of rear USB ports, located in the rear center armrest. The Touring also adds a leather-wrapped steering wheel and shift knob, rear climate control vents, and Mazda Advanced Keyless Entry. The range-topping Grand Touring trim boasts 19-inch aluminum-alloy wheels, adaptive headlights, LED fog lights, heated side mirrors, rain-sensing wipers, a power moonroof, and a power rear liftgate. Inside, the Grand Touring comes with full leather seating, an 8-way power driver’s seat with lumbar support, a navigation system, auto-dimming mirrors, SiriusXM satellite radio, and a 10-speaker Bose premium stereo. 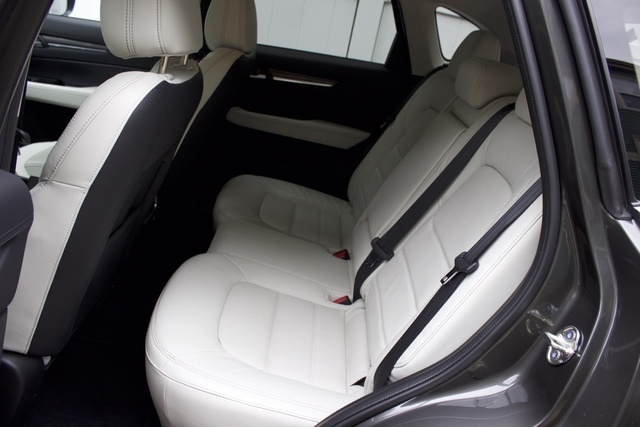 The leather front seats in our Grand Touring test model provided plenty of legroom, and the seats themselves were very comfortable. Frankly, we expected the seats of a sporty crossover to be firm, but these were luxury-level plush and would be a fine place to sit for a long road trip. No matter which trim you select, the CX-5 comes with a 2.5-liter 4-cylinder engine that makes 187 horsepower and 185 lb-ft of torque. Power gets sent through a 6-speed automatic transmission with manual shift mode to the front wheels or available all-wheel drive (AWD). Here are the EPA fuel economy stats for the CX-5: The FWD model gets 24 mpg city, 31 highway, and 27 combined, while AWD versions return 23 city, 30 highway, 26 combined. Our AWD test car spent time driving in both the city and on the highway over the past week and averaged 26.3 mpg. Considering the Volkswagen Tiguan that we recently reviewed got 19.3 mpg, that’s a rather impressive figure. There is a Sport mode button next to the shifter that holds shifts longer and quickens throttle response, but even in normal cruising, when you give it just a bit of throttle, the CX-5 wants to downshift. You can take over with the manual shift mode, but the CX-5’s shift mapping encourages acceleration, and you won’t be waiting for the downshift the way you would in the Tiguan or one of its many other compact SUV competitors. The acceleration is refreshingly strong, but the best aspect of the CX-5’s driving dynamics is its cornering ability. Mazda says the CX-5 has a stiffer frame, which should contribute to that performance. But you can also thank Mazda’s G-Vectoring Control system. G-Vectoring Control works like this: When you brake and enter a corner, it modulates the torque being sent to the wheels to counteract the suspension overloading on one corner and help level the car. And a level car turns quicker and more cleanly than one that gets unsettled. The whole system improves the steering feel of the CX-5, all without the driver doing anything different. As for the brakes, they provide plenty of stopping power, but they feel soft. 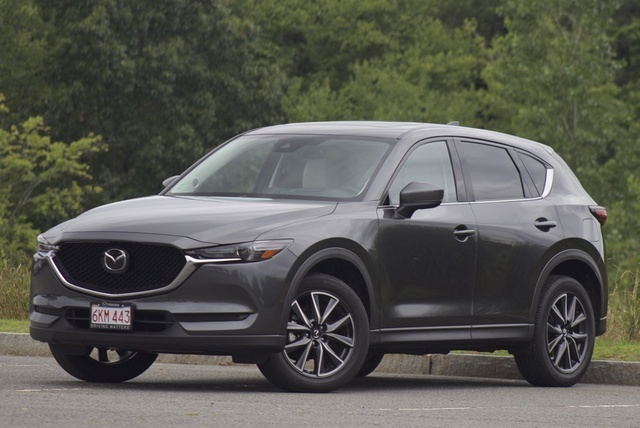 We’d like a bit more feedback, however, we can live with a soft brake pedal if the compromise is driving a family-oriented car that accelerates and corners as well as the CX-5. We mentioned the terrific front seats, but they come at the cost of backseat space. Try putting a full-size adult in the front seat, and have another full-size adult climb into the seat behind them—without adjusting the front seat. Other compact SUVs are growing in size and allowing for not only spacious rear seats, but even third rows. No such luck with the CX-5, though the second row will be fine for kids on a regular basis. Another issue we have is with the USB-port placement. There’s a convenient tray for your smartphone in the center stack, but the USB ports are actually in the center console compartment. That means you’d either have to plug the phone in and store it in the center console compartment, or run the USB cable out of the compartment and place the phone in the cup holder. Either way, putting the ports in the tray at the bottom of the center console would have been a better design choice—and it’s one that many competitors are making. Probably the biggest letdown is the cargo space of the CX-5. With the rear seats up, it has just 31 cubic feet of space—3 cubic feet less than the outgoing model! You could fold the rear seats down, but that will leave you down 5.2 cubic feet from the 2017 model at 59.6 cubic feet. Those numbers are well below competitors', such as the Honda CR-V, which has 75.8 cubic feet. In fact, if you look at the Subaru Forester, Toyota RAV4, and Nissan Rogue, they all have at least 70 cubic feet. 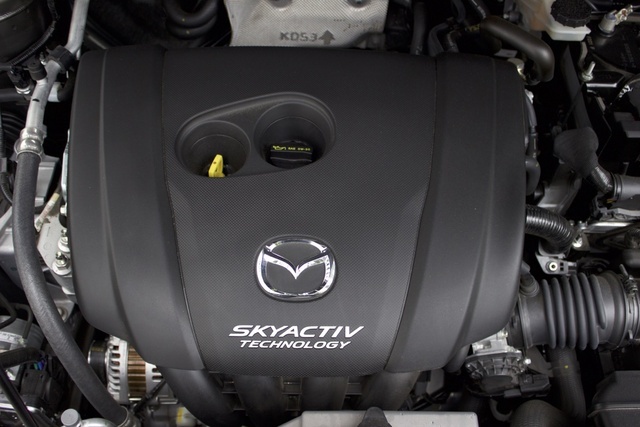 Mazda took a gamble with MazdaConnect. Almost every non-luxury automaker employs a full touchscreen. Honda even uses dual screens (though that system is miserable). If you are shopping for a compact crossover, the MazdaConnect controller system will be completely different from any of the other options in the segment. When driving, you operate the system via the rotary dial between the shifter and the center-console compartment. This dial controls functions like the stereo, phone, navigation, and vehicle settings. 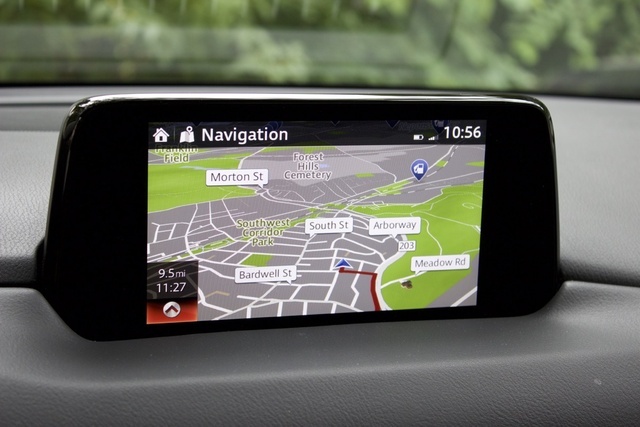 When the CX-5 is in Park, the screen actually becomes a full touchscreen. You can still use the dial to control it, but it is nice having the touchscreen available to you. The CX-5 still doesn’t offer support for Android Auto or Apple CarPlay. Mazda says these popular tech features are on the way, but for now, no dice. 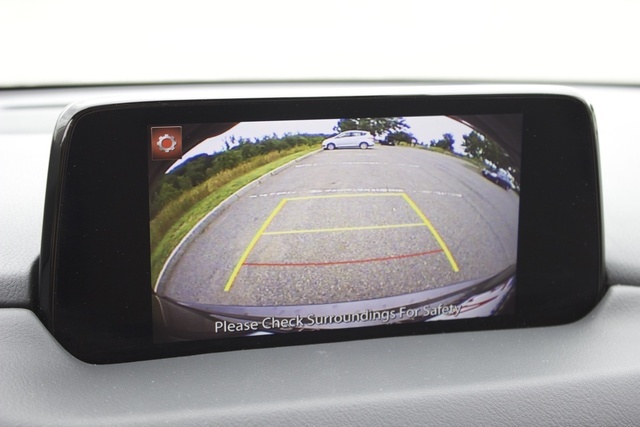 Additionally, the head-up display, or HUD, that came on our Grand Touring test model was a bit cluttered. It was vivid, easy to read, and even employed street-sign recognition (which is displayed on the HUD), but it also packed too much information into the tiny screen. The CX-5 comes standard with front- and side-impact airbags, a tire pressure monitoring system, and Smart City Brake Support. The latter can pre-charge the brakes, which means the CX-5 will employ full braking power if/when the driver even lightly taps on the brakes. This system can even detect a possible crash at low speeds and will engage the brakes automatically if the driver does not act. If you go for the Touring trim, you'll get blind-spot monitoring and rear cross-traffic alert. The Grand Touring comes with adaptive cruise control, lane-departure warning, and automatic emergency braking, which is there to detect potential impacts at higher speeds. Because of these features, the CX-5 has been named a Top Safety Pick+ by the Insurance Institute for Highway Safety (IIHS) when equipped with automatic emergency braking. The 2017 Mazda CX-5 carries a base MSRP of $24,045 for a Sport trim. A Touring model starts at $25,915, while a Grand Touring model starts at $29,395. If you want AWD on the Grand Touring trim, like our test model, it starts at $30,695. Our test model also came equipped with the Premium Package. This $1,830 option adds heated rear seats, a heated steering wheel, and the HUD. With this package and a few other options and destination, our test car came in at $34,085. As compact SUVs go, that's steep. For that price, you could get an entry-level version of the CX-5’s big brother—the 3-row CX-9—and still have cash left over. And while it has a hatch area, this Grand Touring model feels almost too nice to get dirty with a mountain bike or sand-covered beach gear. Put the CX-5 in the context of the 2018 Volkswagen Tiguan we recently reviewed. It represents a pivot by Volkswagen to go mainstream, losing some performance, but appeasing the typical crossover buyer with 73.5 cubic feet of cargo space, plenty of second-row legroom, and an available third row. The CX-5 essentially now occupies the space that the Tiguan once held. There are many compact crossovers on the market, but the CX-5 is a more upscale option and one targeted at the urban dweller. We love the fact that it's more fun to drive than your average CR-V or RAV4. Mazda isn’t even looking to dethrone the CR-V or rival the utility of the outdoorsy Subaru Forester. It makes more sense to think of it as a more affordable BMW X3… and that’s a niche Mazda is perfectly content to own! What's your take on the 2017 Mazda CX-5? Users ranked 2017 Mazda CX-5 against other cars which they drove/owned. Each ranking was based on 9 categories. Here is the summary of top rankings. Have you driven a 2017 Mazda CX-5? I have slightly over 2000 miles on the odometer and have filled the tank 7 times. If I plot "Gallons Added to Tank" vs "Miles to Empty" it form a straight line with a zero intercept of 11.7 gallons.